The message that loved ones choose to put on the memorial of someone they have loved and lost is highly personal. As a lasting tribute to someone who has been held so dearly in life, it is important to take time to think of the message that marks their life and a symbol is often used to send a message that words would struggle to convey. Gravestones and headstones are created and put in place with all sorts of personalised messages but some themes are frequently repeated. Common symbols used on gravestones and memorials in the UK include signs of peace, devotion, loss and religion. Doves: These birds are ubiquitous with wishes of peace and are often included on headstones to wish peace for the departed. A dove in flight is also seen as symbolic of the journey to heaven. Angels: The image most commonly associated with heaven, angels on a memorial can reflect a life taken too soon, grief and the journey to heaven. Celtic cross: A symbol of eternity and the unification of heaven and Earth. Hands: Clasped, pointing upwards, pointing down or joined in prayer, hands are a powerful symbol indicating the journey to heaven and religious devotion. Flowers: Different flowers are added to gravestones and memorials to signify various messages. Roses symbolise beauty and love, while lilies are traditionally associated with death. Daisies are used to show innocence and youth. 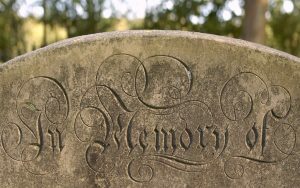 These are just some examples of how symbolism can play an important part in creating a message of love and loss for a gravestone or memorial. Whatever a family might want to show in their tribute, traditional symbols may help. The beauty of symbolism is that while many people prefer simplicity, a small image will compliment this but it will also be a worthy part of a more elaborate tribute. For advice on creating a gravestone or memorial that is personal to you and your family please get in touch with Davis Memorials.